This year, my son’s Little League team is the Angels. Although I am an Orange County resident, there is a lot more to my relationship with the Angels than it just being the team in our community. I grew up in the San Fernando Valley, so the Dodgers became my ball club. The Angels in the sixties and seventies were second fiddle. They were like the Clippers of baseball but with a much better owner. Furthermore, my mom was a Hollywood Stars fan growing up. The old Los Angeles Angels of the PCL were the Stars’ hated rivals. Despite that, we decided to take in a California Angels game when we were visiting Anaheim in 1978. Back then, the Halos were turning their fortunes around. They had great players like Nolan Ryan, Ron Fairly, and Bobby Grich. They also had Lyman Bostock, a player with great promise who died tragically. Anaheim Stadium was a strange place back then. It had no outfield bleachers. There was just the Big A scoreboard in left. It would flash the team’s rallying cry, “Yes We Can!” It wouldn’t flash in rhythm, so you couldn’t use it to start a chant. (They could have used a Rally Monkey.) 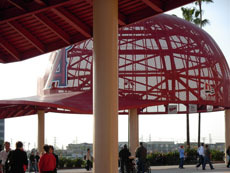 Still, Anaheim Stadium was a nice place to watch a ball game. They let the fans walk across the field after a game. In those days, the outfield grass was plusher, and it felt like we were walking on carpet. Best of all, the Anaheim Stadium parking lot was much easier to get out of than the one at Dodger Stadium. We didn’t have to leave in the seventh inning to avoid getting stuck in the lot for an extra hour. The next year, the Angels made it to the playoffs for the first time — but it was the September when my mom had her paralyzing stroke. I would catch bits of Angel playoff series on the radio as I drove to the hospital to check on my mom, but I couldn’t follow or enjoy it. All that I remember of that series was that the Angels lost, and the team that won got beaten by the Pirates. The Angels are a whole different ball club today. Back then, I didn’t come across any actual Angel fans, even when I moved to Orange County. Most people at an Angels game were there to root for somebody else. Today, I know plenty of diehard Angel fans. You go to an Angels game now, you find yourself immersed in a throng of red. If you’re wearing another team’s cap now, you’d feel out of place. You’ll find the Angels’ A on the back window or trailer hitch of most cars. When they make it to the playoffs, which they seem to do every year, out come the bright red Angels car flags. When Nick Adenhart died last year, there was a tremendous outpouring of grief throughout our area. Fans made a makeshift memorial in front of now Angel Stadium that remained for the rest of the season. If the community is more connected to the Angels, one reason is that the Angels are more connected to the community. Whenever our league needs a speaker for Opening Day, the Angels are always good about sending someone out. They host the Challenger Classic where Little League’s division for the developmentally challenged play. They sponsor blood drives, reading programs, and other charitable work. 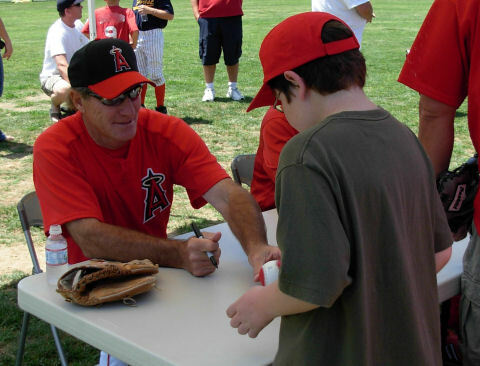 They offered a clinic at a local park in 2007 where a number of Angels, including Bobby Grich, came out to coach the kids. It was my son’s return to baseball after he sat out from Little League for a season. So, this Dodger fan is very happy that my son is an Angel this season. Was the Adenhart tribute kosher? Look what I found at the 99 Cents Only Store!